Vinyl siding is a great building material; it’s durable, long lasting, and is relatively easy to clean. However, in the South Florida weather, vinyl siding is liable to get dirty. Dirt, grime, sun damage, and more can take its toll over the years, and it’s important as a homeowner to keep your home exterior in tip-top shape. Not only will you improve the curb appeal of your home, but when you hire a professional vinyl siding cleaner, you increase the lifespan of your home’s exterior. 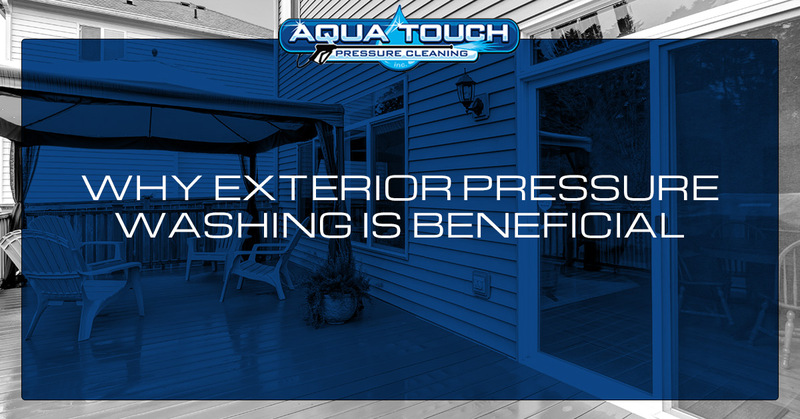 In this post, Aqua Touch Pressure Cleaning of South Florida will be sharing the top benefits of exterior house cleaning as it relates to vinyl siding. If you’re ready to call in the exterior cleaning professionals, contact us today! Want to learn more before you call us? Read this blog post! Over the years moisture lends itself to mildew, mold, and more. Add in seasonal winds and you’ll find your vinyl siding collecting a plethora of undesirable particles and debris. Surprisingly, mildew and mold can cling to and grow on the exterior of your vinyl siding, if left unattended for long enough. Furthermore, this mold will work its way into your home’s framing, and, eventually, into the interior. Mold has been linked to various health issues otherwise avoided, in this case, if you power wash the exterior of your home. Exterior house cleaning removes the grime, mildew, and dirt from your vinyl siding. As simple as exterior home cleaning may sound, it can increase the value of your home. The way your home looks from the street (curb appeal), and how it feels to those visiting or interested in buying can be influenced with a clean exterior. It’s been reported that a clean looking home exterior is more likely to sell for a higher price than one that’s been gathering grime, mildew, and dirt for years. Exterior home cleaning services increase home value. That’s right! A routine exterior home cleaning can prevent costly exterior repairs. Vinyl siding is tough, durable, and long lasting; however, if mold beings to form on or behind the siding, it can ruin it. This means you will be replacing siding panels to protect your home. This repair is substantially more expensive than a simple exterior pressure washing service. Pressure washing services in South Florida prevent exterior home repairs. The environment is full of pollutants that we have little to no control over. These chemicals can settle on the exterior of our home, causing damage, health issues, and more. Some of these pollutants include smoke, acid rain, bird excrement, and more. Pressure washing services remove harmful pollutants from your home’s exterior. One of the biggest benefits to exterior home power washing is that it saves you time compared to other exterior home cleaning methods. You could use a brush and soap, a hose and soap, or a garden sprayer and cleaner, but all of these methods take way too long. When you choose to power wash your home, it’s quick, easy, and effective. Furthermore, hiring a pressure cleaning company in South Florida to take care of it for you saves even more time! Depending on how often your home is exposed to the elements like UV rays, wind, and salt, you will want to have your home exterior cleaned at least twice a year. In some cases, homes need to be pressure cleaned at least once a quarter or four times a year. This suggestion all depends on where your home is, how often it encounters the elements, and your desires as a homeowner. It can be disheartening to see how dirty your vinyl siding can get over the years. A simple soap and rag will reveal just how serious the dirt and grime buildup on the exterior of your home can get. It’s time you called the professionals for exterior home cleaning services in South Florida. At Aqua Touch Pressure Cleaning, we offer a variety of power washing services for home exteriors. Contact us today to learn more!